Sore muscles may occurrence after a strenuous workout or after you use them in new ways. But if you suffer from chronic sore muscles, it may be a sign that something else is going on in your body. Calcium and magnesium are linked to bones and muscles, and regulate their contraction and release. If you have a consistent problem with sore muscles, see your doctor to determine the best treatment. Calcium is an important mineral for health of your bones, nervous system and muscles. Calcium needs do not decrease with age, even though the ability to absorb calcium does, according to the National Institutes of Health Office of Dietary Supplements. The RDA is 1,000 milligrams per day for men and women ages 19-50, and men over 50. It is 1,200 milligrams for women over 50. Calcium deficiency signs include back or neck pain, bone tenderness, loss of height or osteoporosis. Poor appetite and muscle cramping may also indicate low calcium. Magnesium is another mineral that is important for bone and muscle health. It works in conjunction with calcium to relax nerves and muscles. Magnesium deficiency is sometimes characterized by constipation, as magnesium relaxes the intestinal muscles. Sore muscles, headaches, irregular heartbeat, PMS, cramps and heart disease are other possible symptoms of deficiency, according to the Office of Dietary Supplements. The RDA of magnesium is 400 milligrams for men 19 to 30 and 420 milligrams for men 31 and over. For women, it is 310 milligrams per day between ages 19 to 30, and 320 milligrams after 31. Calcium and magnesium play roles in muscle health. Magnesium helps muscles to release, while calcium helps them to contract. That is why it is so important to obtain a balance of the two minerals. If you aren't getting enough magnesium, your muscles may cramp and spasm more easily. Also, byproducts of metabolism such as lactic acid become harder to flush out without enough magnesium, which may lead to sore muscles. Calcium and magnesium need a fine balance in the body to work properly. Do not supplement one without taking the other. 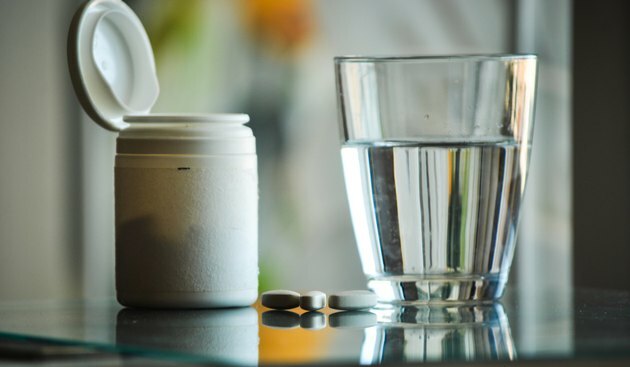 Kathryn Fuchs, author of User's Guide to Calcium and Magnesium, notes that many supplements contain a ratio of 2:1 calcium to magnesium when the ratio should be more 1:1, so check with your doctor before beginning to supplement. You may be suffering from sore muscles due to another deficiency or illness, so be sure to talk with a health care professional. Does Calcium Help Muscles Contract? Can Certain Vitamins Help Weak Leg Muscles?